Well, since our last post we have made it into Puerto Rico, along it's South coast, up the West and made two failed attempts to leave - 165 nautical miles (192 miles) in total in the past week. We have slept on a driveway, in an attic, and been given a room on four other happy occasions. We have fled to shore after being caught out in lightening storms, suffered sun burn and dehydration, been molested by vicious mosquitoes and managed to hitchhike 5 miles to a supermarket and back. In the last week of hard kayaking we have moved about half a centimetre across the world map. It is difficult to know what to write in these blog updates. We are sure many people probably think we are just bouncing up the Caribbean from one nice resort to another. Our experiences of finding places to stay and the hospitality we have received (and not received) are the interesting parts for us... it is nice to switch off from the pain and misery of the kayaking... and so this is what we tend to write about. It is, of course, not the whole story. Hitchiking back from the supermarket. Apparently, it is the kayaking (or our pain and misery to be more specific) that people reading want to actually hear about. We'll try and get a balance. The newest addition to our kayaking knowledge is that of thunderstorms. Lightening is a hugely exciting phenomenon and of course is nothing new to us. We have seen many a storm while at home, driving along a motorway or in the mountains. The chance of getting struck by lightening is usually miniscule. However, when you are the only object sat above the surface in a massive expanse of water, the odds suddenly become somewhat less favourable. In fact, being 2 miles out to sea (relatively close to shore thankfully), having a thunderstorm charging over the mountains towards you is terrifying. Absolutely terrifying. 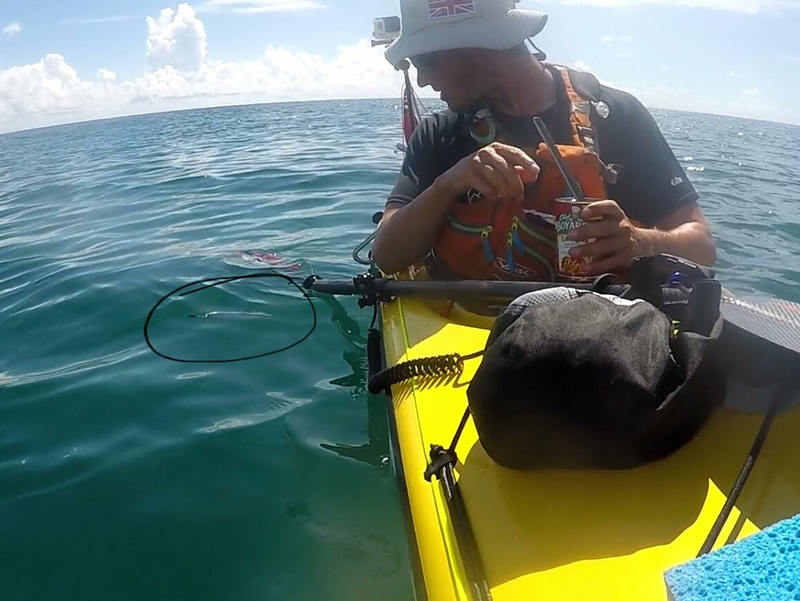 This was the case on a couple of occasions during our days kayaking down Puerto Rico's South coast. At this point we hadn't researched much into thunderstorms or the advice for kayakers. It is not like being in a yacht, where the mast is a lightening conductor and will ground any shock to the sea. For us, the tallest point for miles around is the top of our heads... and we're holding carbon fibre paddles (conduct electricity brilliantly). When you are fatigued, hungry and have a target mileage for the day the obvious decision - i.e. get off the water as soon as you hear thunder - suddenly becomes a difficult one to take. 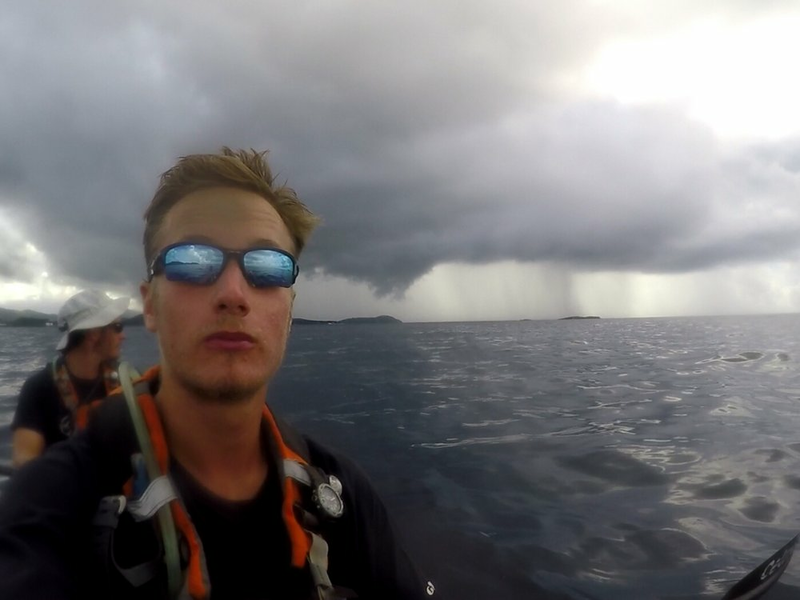 You can imagine us tired, hungry and getting pelted by rain watching this big cloud from 30 miles off.... 20 miles off... 10 miles off... wondering whether to keep paddling or not. What are the chances of it going wrong anyway? Eventually, on each occasion we decided to seek refuge on land. It was the right call every time. Puerto Rico is different to the other islands we have moved along so far because of its size and its mountains. These mountains create two problems for us. The first is storms with the rain (miserable) and lightening (scary) they bring. The second is variable winds that can offset and often reverse the forecasted wind. If you have no interest in wind, skip the next paragraph. 1. Anabatic - As the sun comes up in the morning it starts to heat the cool sea air. As it warms up it becomes less dense and rises from sea level towards and up the mountains. This creates an on-shore wind which is a pain because we are usually trying to head away from land in the mornings and thus into wind. 2. Katabatibc - The opposite occurs as the sun goes down. The air starts to cool, becoming less dense and falls off the mountains creating an offshore wind i.e. straight into our faces as we are trying to get into land in the evenings. It is hard to offer what a typical day looks like for us at the moment. Back in the Caribbean islands our program tended to follow a cyclical pattern, starting with arriving on the South coast of an island. 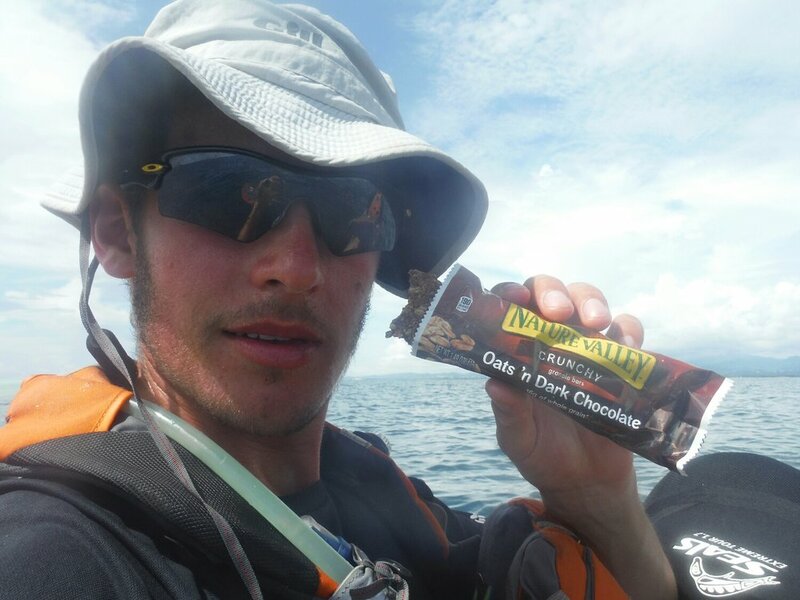 One day paddling up the West coast. Leave at 1am to get to the North coast, have a leg stretch and breakfast on the North coast, then relaunch at 5.30am (first light) to start the crossing to the next island. Then repeat. 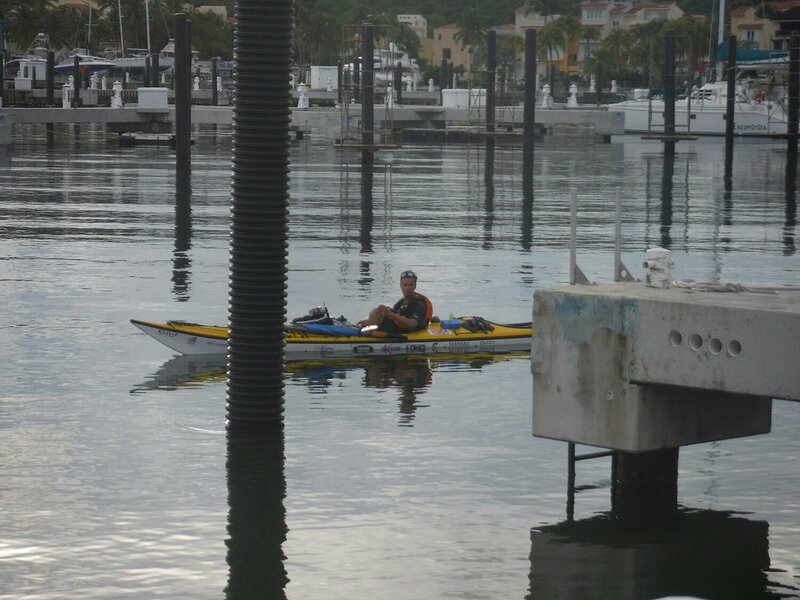 Kayaking around a marina looking for a place to stay. Now we always try to finish our days at around 4pm, so we have time to find accomodation or a camping spot before it gets dark. This means starting our day at any time between 1am and 8am depending on the distance we intend to cover, normally dictated by the next available accomodaton. On crossing from the Beachcomber Hotel, USVIs to Culebra - a little island that is part of Puerto Rico - we had nowhere organised to stay and little opportunity to camp close enough to the town where we could pick up the supplies we needed. Fortunately, as we were paddling down the big bay we came alongside a boat on a private dock to ask where we might be able to leave the kayak while we head to customs. The kind landlord, Luis, allowed us to tie up on his pontoon and what's more kindly offered for us to sleep on his drive. We had an easy (ish) time getting through U.S. customs and immigration at the airport, found a small supermarket to restock, then had an entertaining evening as we tried to get to sleep on the drive... in full anti-zika attire... while the residents had a Friday evening celebration. I guess we chose the wrong drive. Full anti-zika measures... going to sleep on Luis driveway. Amazingly though, just as we were about to bed down in the marina loos to shelter from the rain we got talking to someone and through a couple of connections who must all remain nameless to protect their identities (and their jobs) got us a shower and a couple of beds right by the marina. Guys, if you read this, thank you!! So after a quick snooze we were back on the water for 3am and making our way down the South coast towards Salinas. It was a llong and hot day with very little breeze, but we were accompanied most of the way by a small fish of some sort. You can imagine how I jumped when I put my feet in to cool off and it whipped out from under the boat to have a nibble!! However, it turned out we hadn't picked the wrong drive to sleep on back in Culebra. Luis, the owner, also happened to own a restaurant in Salinas with a couple of rooms where he allowed us to stay and eat. El Dorado is a fantastic venue and well worth a stop over if you are passing by.. or even if you are not! We were taken care of fabulously by Alex, who brought us plate after plate of food and even sorted us a lift to the supermarket. A real treat... our budget doesn't normally stretch to such delights. Carrying on along the South coast we soon had our mad dash to shore as our first thundrstorm came over. We sheltered in the mangroves for half an hour - well, George lasted about 5 minutes before deciding to risk the lightening over zika as the mosquitos came out to play - before continuing on to Cobada Beach House. Jorge, our host, kayaked out to guide us through the reef lining the beach, for which we were very grateful given our previous experiences with reefs and kindly sorted us out with dinner, breakfast and snacks for our next day! And more rain... bit of a theme for Puerto Rico so far. It was certainly a flying visit, and we were off again. However it was not long before more thunderstorms brewed and we were forced to sprint 2 miles into shore. We must have looked quite a state when we walked into the reception of Copamarina Beach Resort asking for them to sponsor us a night. Very fortunately some nice manager took pity on us and set us up with a room for the night. It seems odd walking into a nice hotel room but being upset we were not in a miserable campsite if it meant being 10 miles further down the coast. We left early the next morning and kayaked again. Monotonous is the best word to describe the hours between 8am-4pm each day and there is really very little to write about. We will though follow up over the next couple of weeks with a series of 'how are we prepared' videos/posts to show you how we are dealing with some of the challenges such as navigation, the sun, sharks, eating, weather forecasting etc. "But they said my arms would get bigger!..." On the evening of the 3rd November after a night in a mosquito filled hell hole and a brutal kayak up the coast into wind and tide - one of our hardest yet! 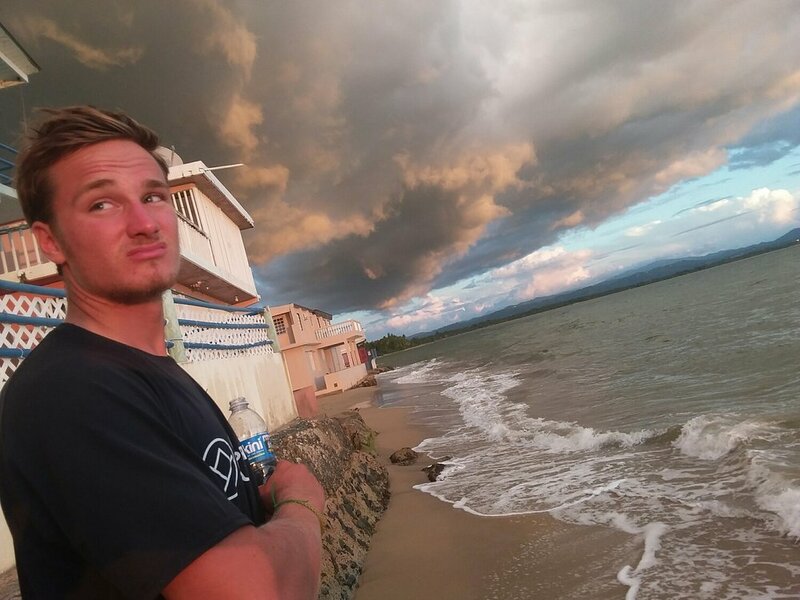 - we made it up to Rincon, where we have been accommodated by the wonderful and hospitable Carlos in his Blue Whale Beach Apartment (listed on AirBNB). 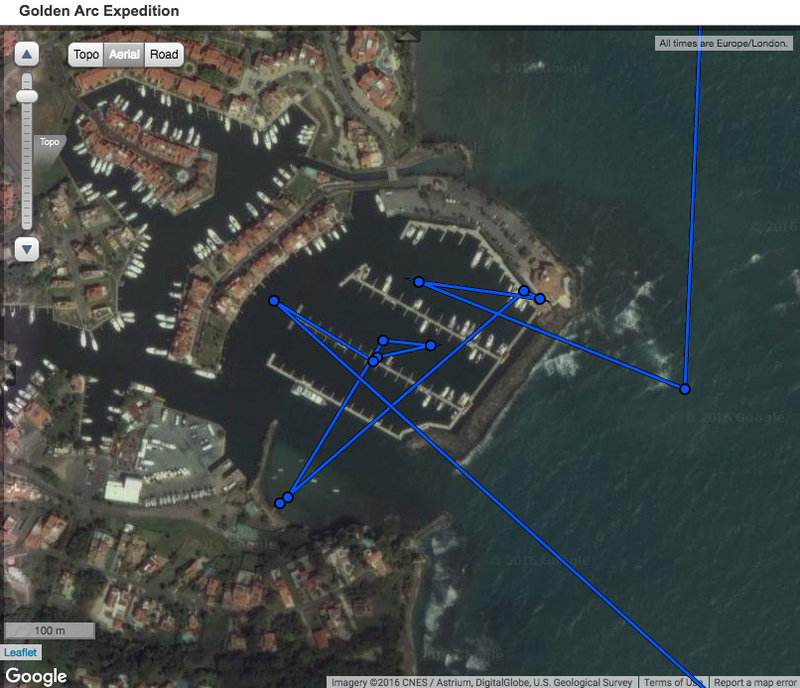 We are now here, enjoying a rest day preparing for the "murderous" Mona Passage! Storms coming over off the mountains.